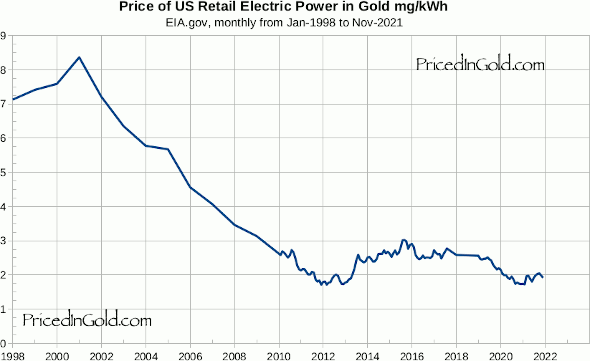 This chart shows the retail price of electric power in the US, given as mg of gold per kilowatt hour. It is based on an average price paid by all sectors (residential, commercial, industrial and other) in all areas of the country, as reported by the US Energy Information Administration. This series is annual from 1998 to 2009, and monthly thereafter. Prices for gasoline were rising slowly from 1998 to 2001, when they peaked at 837 mg. Since then, they have gradually fallen each year to about 181 mg today. Yet over the time period covered by this chart, the dollar prices of electricity have risen from $6.74 to $9.65 per kWh. Rather than complaining about the high cost of power, you should realize that prices are near their historic lows!